A new event format for this year, designed to accommodate increased attendance, includes the dinner from 5 to 6:30 p.m., followed by the separate main program from 7 to 8:30 p.m.
Due to the high demand for this event, tickets for the $30 combined dinner (5 to 6:30 p.m.) and main program (7 to 8:30 p.m.) option have sold out. Tickets for the main program alone are still available via the links below, in person at the Dome Box Office (Monday through Friday, 8:30 a.m. to 4:30 p.m.), and by phone (888-DOME-TIX or 315.443.2121, option “zero”). *Students in need of financial assistance may request discounted tickets at chapel@syr.edu. After 4 p.m. on Friday, Jan. 25, all tickets purchased through these links will be emailed to guests at 4 p.m. on Sunday, Jan. 27, the day of the event. These e-tickets can be printed or shown on a smart phone at the gates of the Carrier Dome. 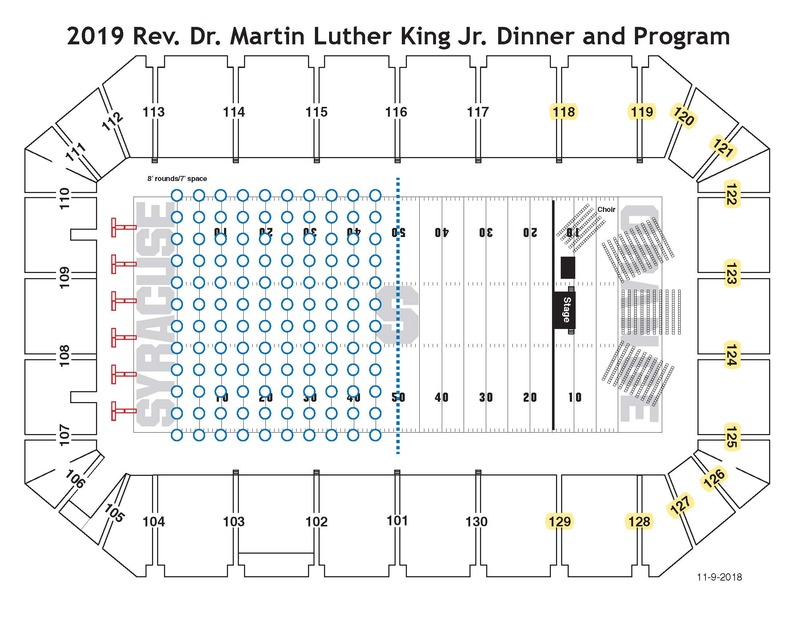 Tickets to the Main Program Only will also be sold at the Carrier Dome Box Offices on the day of the event, starting at 4 p.m. and continuing through 7 p.m.
Below is the event floor plan. The sections highlighted in yellow indicate where all attendees are seated for the main program. The blue circles indicate dinner tables. All dinner attendees will be moved to a reserved section for the main program following the conclusion of the dinner. Please contact Hendricks Chapel at chapel@syr.edu for questions regarding ticketing for this event.